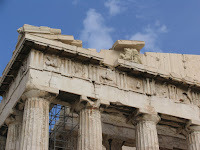 At the end of July Christopher Hitchens and James Cuno were in debate over the Parthenon sculptures. Hitchens argues for the reunification of the sculptures that were intended to be seen as a unity. These would be displayed in the Acropolis Museum adjacent to the acropolis. Cuno suggests that the sculptures could be 'reunified anywhere', and that London was just as good as Athens. (Hitchens can be heard saying, 'What about Glasgow?'). Cuno observes that the Parthenon sculptures in London are displayed in the context of world cultures. He also argues for the changing role of the Parthenon through time as Greece became part of the Roman Empire and then the building itself was converted in a church and then a mosque. He talks about the Pericleian temple as a 'fantasy of a building' and at times speaks as if it was the Parthenon itself that was to be restored. Hitchens responded with a reminder that the Parthenon sculptures are a 'narrative in stone' that at the moment are displayed at 'opposite ends of the European Union'. Cuno returned to his well used them of the Encyclopedic Museum and the theme of nationalism. He talks about the clearing - he uses the word 'cleansing' - of the Athenian acropolis in the early decades of the Greek state as an example of 'nationalist ambitions of a modern nation state'. He even suggests that such tidying up of the acropolis was 'desecration'. At times Cuno seemed to be speaking as if he he was a spokesperson for the British Museum. In my view Hitchens was the more convincing speaker especially with his case for the reunification of the sculptures. La ideal que estas lugares u obras arquitectonicas se conserven en los lugares historicos y sean patrimonio mundial y nacional.Que obliguen a mantener y cuidar estas obras que son testigos del tiempo y de la historia de la humanidad desde su pasado. Parthenon sculpture is really amazing.It is a really great historic place and most of the tourist come for to see these temple.